This guide looks at seven amazing gas-powered RC cars and trucks. These models differ significantly from the familiar electric powered RC vehicles. But why do people bother with nitro cars in the first place? After all, the electric-powered options are cheaper, cleaner, safer, and require less maintenance. 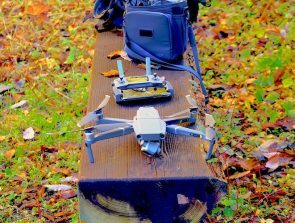 Well, gas-powered models are faster, louder, more durable, and highly customizable — I could go on. The table below shows the order my gas powered remote control cars appear in this guide. I’ve ordered them by best budget, best value, and top pick first. The four that follow are in price order, starting with the least expensive. Powerful 2.67cc nitro engine and adjustable suspension. Metal-gear transmission & sealed differentials. 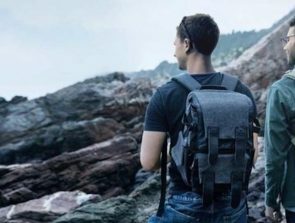 Fast, durable, versatile and has a unique suspension design. The fuel used to power these crazy RC vehicles is nitro gas. Some of the top racers can exceed 110mph with a premium fuel mix and the right setup. Now compare that to an average speed of 35+ mph with the faster electric alternatives. You can start to see the attraction, right. Nitro gas is a mix of nitromethane, methanol, and lubricating oil. The engines run primarily on methanol. The added nitromethane acts as a performance enhancer. The part of nitromethane is usually between 10% and 40%. There’s more to it than that, of course. But I don’t want to get overly technical as this is a beginner’s introduction after all. The bigger nitro-powered RC racing cars are not for the faint-hearted. Yes, they’re simple to drive, but no, that doesn’t mean they’re easy to race or control on the track. That brings me on to my next point. Unlike their electric-powered counterparts, there are lots of restrictions. You can’t just race larger gas-powered cars wherever you like. And the bigger the car, the tighter those restrictions become. The bigger vehicles are impressive replicas of the real-world ones. They look identical in all but size. They have the same sounds, smells, performance, and use similar components. They may be smaller, but they’re not toys or even toy-like. And you have plenty of maintenance too, just like the real thing. It’s advisable to let the motors of electric-powered RC vehicles cool down between battery swaps. It’s the same with gas-powered engines in that they should cool down between tanks. I wouldn’t suggest anyone at the entry-level jumps in at the deep end. 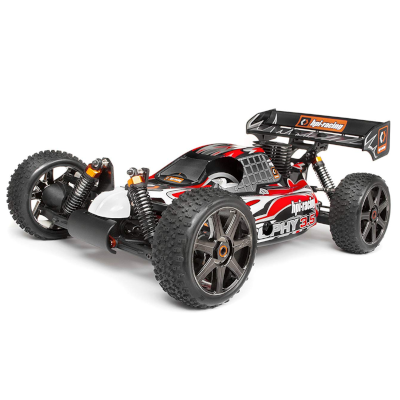 The natural progression to nitro RC cars follows experience at the electric RC level. It’s for serious radio-controlled aficionados. That means folks who want something more from their hobby, and these beasts deliver. They provide a much bigger kick and a more realistic driving experience. They’re also a tinkerers’ dream vehicle. It’s not the purpose of this guide to teach you how to drive or maintain these vehicles. That’s something to learn from your fellow enthusiasts as you go along. This page is a review of some of the most amazing gas-powered RC vehicles around right now. I choose these seven based on personal thoughts, independent user reviews, and the opinions of experts. Meet the Redcat Racing Shockwave Nitro Buggy. It’s an affordable ready to run (RTR) introduction to the world of gas-powered racing cars. You can’t help but fall in love with the design of this puppy. There’s no better start in the world of gas-powered racing cars than a model that’s ready to go right out of its box. There’s a 2.4GHz radio system included too. As an off-roader, it gives you plenty of options on where to drive this little beast. The sound produced by the 2.67cc Vertex nitro engine is incredible. It’s enough to get the adrenaline pumping before you even move off the start line. The Shockwave is an ideal choice at the entry level as well as being my best budget pick. The engine is easy for newbies to tune for one. The build quality is also durable enough to stand up to those inevitable beginner crashes. It’s a no-brainer for anyone just starting out in RC nitro racing. There’s plenty to marvel for sure, but it’s the driving that makes the Shockwave shine. The pull starter works as it should do, but most people prefer electric starts given a choice. Another gripe is that it’s power hungry and gets through a lot of fuel. The fuel consumption is more of a novice complaint, to be honest. Burning through gas is the nature of these powerful models after all. The final gripe is that you should expect to replace some parts. The metal parts are durable enough, but prepare to replace some plastic bits over time. They’re just too fragile to stand up to high impact crashes and collisions. You’re going to love this nitro buggy if you’re a tinkerer though. The Losi® 8IGHT Nitro Buggy RTR is a good progression from the Redcat’s Shockwave above. My best value pick arrives fully assembled and is ready to run soon after you unbox it. The company promotes the incredible 8IGHT 4WD Nitro Buggy with two words: BRUTE FORCE. It goes as good as it looks too. The metal-gear transmission and sealed differentials provide the added durability needed to handle rough racing conditions. The buggy also sports center and rear dogbones that do a great job of eliminating CV coupler friction. They also improve the bump handling at the rear. High performance is fine, but you also want a gas-powered RC car that looks the part. The eye-catching design and bright, standout colors of this angry tiger are striking. This buggy’s 4mm T-6 aluminum chassis plate is almost double the thickness of the previous pick. The Gen III radio tray also helps to prolong the life of the throttle and steering servo. It’s a superb build that resists wear and tear typically caused by chassis flex. The preset suspension geometry is equal to that used by professionals and thus remains forever constant. This gas-powered buggy has heaps of grunt. Its brute force comes from the powerful Dynamite .21 nitro engine. It provides plenty of torque and has an impressive 40+ mph on the stock setup. It’s a great entry-level nitro model for those with experience racing electric powered vehicles. It’s another pull start. There’s nothing wrong with pull starts if they fire up the engine after one or two pulls. The pull start also does away with the need to buy a starter box. Most folks still prefer to use electric starts. It’s a minor gripe, but it needs pointing out. Team Losi’s 1/8 8IGHT 4WD Nitro Buggy RTR is worth every single penny. At the entry-level, though, many users find the price tag a little on the high side. Value yes, but affordable, not really. 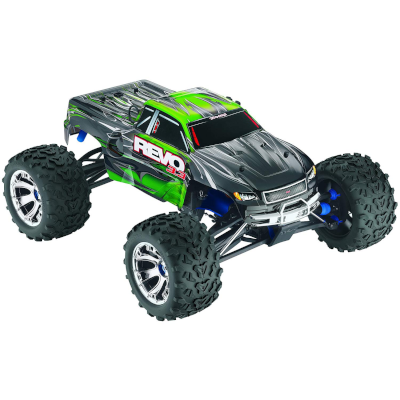 The Revo 3.3 Nitro Monster Truck is my top pick. It has a bunch of impressive features at first glance. The most noticeable is its wider, high-riding stance that provides the ultimate in monster fun. This is a nitro-powered monster truck and not a racing car per se. It’s more about torque than top speed. Despite this, there are claims that it can reach an incredible 45mph with the right setup. It certainly excels in areas of performance, durability, and fine-tuning. You must witness the versatility to size ratio to believe it. Those who buy one of these beauties are unlikely to regret their decision. The Traxxas Stability Management TSM® gives users plenty of confident control. With TSM you get to experience the full power, acceleration, and top speeds the beast has to offer. You can push the truck to its limits without losing control on rough terrains, including loose or wet surfaces. The Revo 3.3’s electronic control is another cool safety feature. It prevents users from accidentally shifting into reverse at high speeds. Operators love the truck’s pre-installed telemetry sensors. The sensors provide invaluable real-time data like temperature, battery voltage, speed, and RPM. It’s a tough nitro truck all right, built to handle tough conditions and survive the knocks drivers expose it to. In short, the Traxxas Revo 3.3 4WD nitro truck has unrivaled handling for all extremes. It’s the fastest, lightest, and the most versatile monster Revo to date. 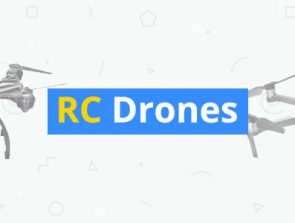 It’s why RC enthusiasts are mad about it. Seriously, there aren’t many gripes at all, though users may come across a few issuers later. Finding shared complaints is impossible. At around $600 it’s not cheap and an obstacle for some. The price puts it out of the reach of many entry-level users who would love to own one. But for those who can afford it, well, the price tag is more than justified. Just look at this thing. 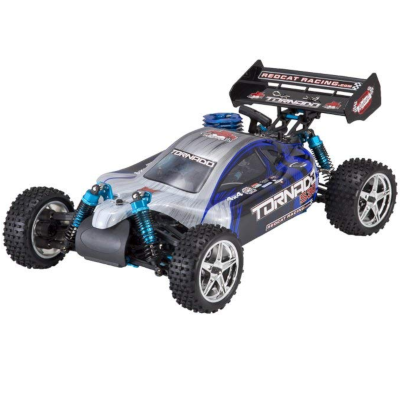 The Redcat Tornado S30 4WD nitro buggy is so souped up it seems unnatural standing still. This gorgeous 1/10 scale model has a lot to offer so let’s take a closer look. This fast, off-road racer should reach 35+ mph with its powerful 3.0cc.18 SH nitro engine. You could probably add another 10 mph with modifications. The 2-speed transmission gives plenty of low-end torque. You get lots of control, though you may not always see this beast with the debris it kicks up. And the finely tuned aluminum exhaust pipe lets out a racy roar that adds to the enjoyment. The build of the Tornado S30 uses plenty of blue anodized aluminum parts. These include tunable oil-filled coil over shocks, a 2.5mm chassis, race adjustable shock towers, and a heat sink. It’s a great entry-level nitro RC racing car for the money. One of the problems is getting spare parts as there’s no hobby shop support. That means you can only order online only. This brings me to the next point. This car is fast and handles well, but you will crash it at times, and you will need replacement parts. It’s not quite as tough as it looks despite its aluminum parts. 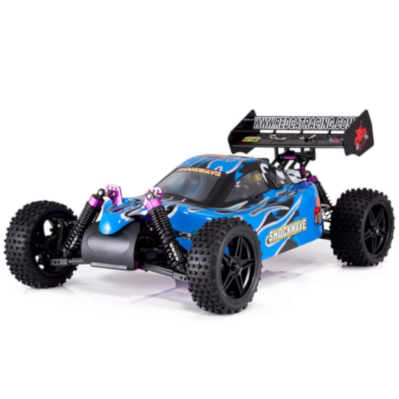 At number five is another gas-powered RC car by Redcat. 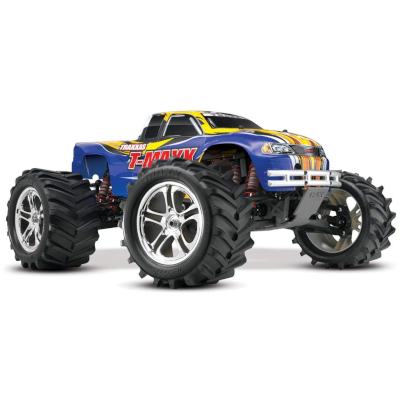 This one’s the Racing Earthquake 3.5 Monster Truck with a powerful 3.5cc nitro engine to drive it forward. The Redcat Racing Earthquake 3.5 Monster Truck borders on a semi-truck. It’s part of Redcat’s ultra-light performing RC series. It’s a model for the tinkerer, which means an interest in checks and maintenance as well as driving. Skip this review if you’re only into the latter. The 50+ mph and incredible acceleration are sure to put this baby onto the shortlist if speed’s your thing. It has an impressive construction too. There are the excellent composite disc brakes, the sealed front & rear differential, and a highly responsive 2-speed transmission. Most of the complaints come from people who bought this truck before they were ready for it. It’s not an ideal nitro RC vehicle for the newbie. It’s one of those bigger models that needs a little TLC, regular maintenance, diagnosis, and tweaking. You won’t enjoy this model unless you love tinkering. A more legitimate complaint is the pull start mechanism. It’s the main gripe from users who say it’s awkward, easy to break, and hard work. A power starter upgrade is the best way around this. The T-Maxx 2.5 is another fast, high-quality 4WD monster truck. 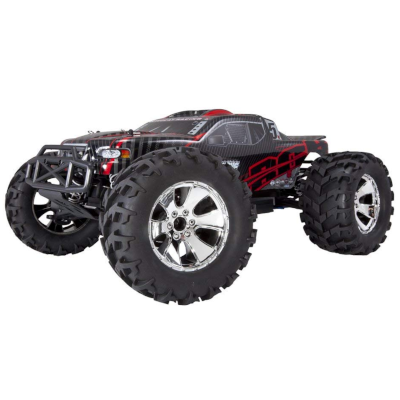 The Traxxas TRX 2.5 Racing Engine pushes this beast to speeds that exceed 40 mph. It’s also a Ready-T-Run (RTR) package, which means it’s almost set to go out of its box. This monster truck guarantees to provide lots of fun at any level. There are a bunch of enhancements on the previous version like the newly strengthened parts. These include differential housings, front and rear bulkheads, and the new engine mount. The adjustable body-mounts are also an improvement on the predecessor. It wheelies, launches off jumps and glides over raised curbs without effort. Starting this gas-powered model is a breeze thanks to its electric push-button EZ-Start. A lot of these models are pull-start which is less popular than the easier electric starters. There’s a lot to discover with this high-quality nitro truck. It’s not difficult to control if you take the time to get familiar with the model. There’s an excellent DVD tutorial that comes with it that everyone should watch. Not all users are happy with this new upgraded version though. There have been several reviewers complain about loose screws. It’s a good idea to check to make sure all screws are tight before you operate the model. I’d suggest making it part of pre-maintenance checks. Another complaint is the absence of an opti-drive. The previous T-Maxx had one. My last pick is also the most expensive in this guide, but is it worth the money? That depends on whether it delivers everything and more of what you want. Let’s look at what it offers. 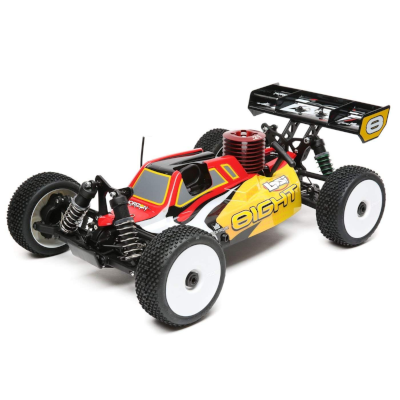 The HPI Racing 107012 Trophy 3.5 Buggy is an off-road racer with lots of protection. The battery compartment, servos, and receiver are all waterproofed. You can race anytime, anywhere, and in extreme conditions. Rallycross buggies are the most popular racing class now and continue to grow. The strong aluminum chassis lets you bash and perform air stunts with confidence and conviction. These are the most standout features, but there’s plenty more to explore with this rallycross buggy. The 107012 Trophy 3.5 1/8 4WD NITRO Rallycross Buggy is not a toy. It’s a car for tinkerers and needs lots of care and maintenance. That’s half the fun if you’re an enthusiast. It’s a headache for those who want a more low-maintenance nitro car though. The other downside is the cost. It’s not cheap so make sure you can justify its price if you’re thinking about it.